Thursday, the US Congress passed the continuing resolution to keep the government funded for another 6 months. It was called House Resolution 117. This isn’t a real budget, its too small to be a real budget. It is a resolution to keep wasting money at the current rate. The Tea Party was against the resolution in part because it included around $1B for Egyptian foreign aid. With angry hordes surrounding the Embassy decrying the evil Infidel, two days after a nearby horde killed an Ambassador, I can see the point. I just though it was stupid to give that much money to anyone when we don’t have it to spend on ourselves. It passed 329-91. That means that most Republicans in Congress voted for it. Check out the complete list of the vote here. I’m not so sure that voting yes was a good idea in the abstract. The Tea Party was sending out emails saying it was, in fact, a very bad idea. (See graphic inset.) If it was a bad idea, then a bunch of Republicans dropped the ball–again. But the Tea Party is supposed to be holding Congressmen accountable for errant spending. Why isn’t the Tea Party talking about Tom Graves (R-Granger), the Georgia 14th Congressman who voted yes if they are really so mad about the vote? The local Tea Party people love Tom, but they hate spending more! However, when your friends step out of line, you have to bring it to their attention. Today I got a long email from Mrs. Thompson and Dooley from the Atlanta Tea Party. Not a word about the continuing resolution. (Lots about State Senator Balfour, the very powerful Senate Rules Chairman facing a criminal investigation over alleged improprieties in his reimbursement report after receiving a hand-slap from the ethics committee. It has only gone this far due to Josh McKoon and the Tea Party.) 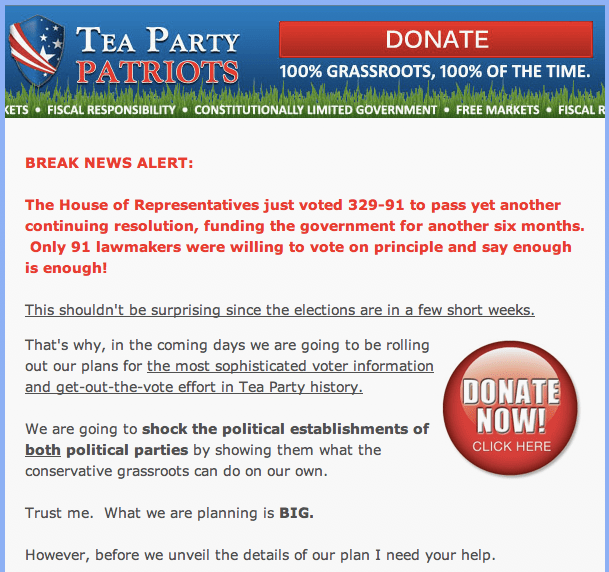 The Lanier Tea Party does not have anything about it (but admittedly I was not on their mailing list until just now.) This is not a local issue, but it was voted for by a local Republican. Now the National Tea Party wants you and I to put the heat on Saxby and Johnny in the Senate to shut the government down 53 days before the election. And when I say “the election” I really mean THE ELECTION! Most Americans don’t like the idea of not paying soldiers, sailors, airmen, marines & coast guard troops, (but ATF, FBI, ICE, Treasury, etc. would be OK) so I’m not so sure that shutting down the government right now is a really good idea. Especially when an axiom of government is that if you make them suffer a little, they will make the citizens suffer more. Bureaucrats have the ability to discontinue the services that inconvenience you the most regardless of the cost-benefit. The pressure to pass a budget should have come months ago. Harry Reid’s failure to bring the budget to a vote is tantamount to treason. Maybe the Atlanta and Lanier Tea party missed this? Or maybe reasonable people can disagree about the vote? But, hey, never pass up an opportunity to get people to donate, right? So was it a bad idea, or an opportunity to manufacture a “grass roots crisis” to get some money, or both? It is hard to be consistent and steadfast. It is harder still to criticize your powerful friends when they are wrong. If Tom wants to tell us why his vote was a good idea, I will be happy to consider it, and post it here for your consideration as well. Since I’m on the fence about the continuing resolution, I say he probably did the right thing except for the $1B for Egypt. The Republicans should have spent the weekend fighting to remove that part. It would have been a perfect time for Doug Collins (R-Gainesville), the Republican nominee for the new Georgia 9th Congressional District, to weigh in on a real issue of conservative interest and national importance. But there was no email and nothing on his web page. In a crisis real leaders have to make lightning fast decision with not enough information. Then they have to take action. They can’t wait for a poll or a focus group or consultant. Sometimes the action is good, and sometimes it is in error. But if you just stand there watching the battle, then you surely will lose. The best leaders anticipate the future problems and have constellations of solutions ready as action plans. Obama was completely unprepared for the uprising in North Africa. Congress seemed surprised by that and that the budget has not passed the Senate. Obama is not a leader, he is a fundraiser. Congress is not showing leadership either. I hope that Tom and Doug can show us that kind of leadership in Washington. Some real ticker-tape parade, flowers thrown onto tanks, hero leadership. We are almost at war in North Africa with $16T debt and no budget, and Obama is raising money and Congress is in recess. Like it is all just some Tom Clancy novel and not real American getting brutally murdered by smelly animals in a foreign cesspool. What. The. Heck? First Paul intimates (does not say it) that the Lanier Tea Party Patriots (LTPP) came out for Tom Graves. This is not correct. LTPP never endorsed Tom Graves or any other candidate. Second, he indicates that the Tea Party should have come out earlier against raising the debt ceiling if in fact that is the correct thing to do. The Tea Party has been a constant voice against raising the debt ceiling and this instance was no different. Third, Paul states “Most Americans don’t like the idea of not paying soldiers,………so I‘m not sure that shutting down the government is a really good idea.” Those that understand the ‘so-called’ shutting down the government know that Congress can keep those parts of government funded it wishes to keep funded. Therefore the military and the few truly essential services can remain in operation if segments that should be shut down permanently were to be shut down temporarily, i.e. Education, EPA, and Energy, to just point out three options of an almost unlimited list. communications with other local tea partys across our nation set the agenda for TPP) he would know that ALL EMAILS THAT COME FROM TPP have an option to donate and the so called “manufactured crises” had absolutely nothing to do with the fact that a donate button was there. If the email had simply been announcing an event of any kind the donate option would be available. Those of us in the tea party are constantly using our own money in our effort to stop the stupidity in Congress and we really do not need a Republican chastising us on thing of which he has no knowledge. That said we do need monetary help from people that know and understand the Republicans and Democrats are both taking our nation down the road to Socialism. The only difference is in the past the Republicans have been doing it VERY SLOWLY, while the Democrats are doing it much more quickly. Fifth, the tea party HAS BEEN CONSISTENT on holding the debt ceiling. We have not changed. In September of 1917 the Federal Reserve was set up by Congress to allow the issuance of about $7.5 million in U.S. bonds, and another $4 billion in certificates of indebtedness. This was all done under the Second Liberty Bond Act. The Federal Reserve System was created in 1913 as Congress reacted to “a crises in 1907” (which would have best been left alone by Congress). It is no coincidence that only a few years after the creation of the Federal Reserve System that the concept of debt limit was instituted. Fortunes are made every time Congress raises the debt ceiling which then allows banks and wall street to issue more bonds on which they ALWAYS EARN A TRANSACTION FEE. The Federal Reserve System was set up under the guise ‘to stabilize the economy’ but the real reason was to allow certain people to increase their personal wealth. The Federal Reserve System is not run by our Federal Government but by private entities. Sixth, Paul should have explored this question, “what caused Tom Graves change the way he has voted on the debt ceiling?” In the past votes Tom has always voted against raising the debt ceiling, so I find it very curious why he changed. Tom has voted the tea party line most of the time. There have been some times he strayed such as when he voted for CISPA. WHAT HAS CHANGED? Could it possibly go back to the message the Republican Party sent during its convention? I would submit that played a part in Tom’s new way of voting. I would also submit that Tom is now unopposed and is free to follow the Republican Leadership’s dictates. For those of you that do not know, the Republicans held a vote that if approved would severely hamper any grassroots movement inside the Republican Party. It essentially would change the Republican Party from a bottom up organization to a top down organization. I was watching on C-SPAN when this vote was taken and there is NO WAY POSSIBLE TO DETERMINE IF THE YEAS WERE GEATER THAN THE NAYS, BUT JOHN BOEHNER DID NOT LET THAT STAND IN THE WAY OF HIS DELCARING THE YEAS HAVE IT AND THE RULE IS ADOPTED. Even the Democrats were more honest than this in their vote on whether or not to add God back to their platform. They at least voted 3 times before the chair declared the vote the way leadership had ordained it would be. And lest you think this was just a goof by Boehner, it was scripted and actually appeared on the teleprompter for him to read that the vote was approved. One old trick that has often been employed by both parties in votes is to have microphones in the areas that are pro a vote turned up while in the against vote areas that are anticipated the microphones are turned down. I strongly suspect that this vote gave Tom Graves the “courage” to now stop following the tea party line and move back into the arms of the RHINOS. So now we will have two in Washington that will be more interested in the Republican Party line than in the tea party line, Doug Collins (assuming Doug wins) and Tom Graves. Paul also seems unsure whether or not the debt ceiling should ever be raised or not and as long as the general public is not willing to take a stand against raising the debt ceiling, it will continue to rise. The tea party understands that if the debt ceiling is not raised, then Congress MUST CUT SPENDING SOMEWHERE. The logical thing then would be for Congress to eliminate the departments it has created in violation of the U.S. Constitution. America will never be changed as long as the people continue place people in office that are more concerned over the Republican Party line than they are freedom. One has to wonder exactly where Paul Stanley stands. Paul knows me and could have talked with me about this, but he chose to speak out of his ignorance on the tea party and while I had hoped he was going to be a voice for change in the Republican Party I am no longer as sure. Time will make it obvious who the real Paul Stanley is. Lastly, the tea party is working constantly behind the scenes. Tea Party folk are constantly calling, faxing and emailing our legislators. This is done as individuals and not as a group. We have had some legislators request that we designate one person to do this instead of individuals. This may be convenient for them, but that concept simple diminishes the strength of the individual and is one step closer to collectivism which we abhor. Once again we see that Mike Scupin, the Lanier Tea Party local coordinator and I think a lot alike (except for the me being ignorant part). He is right that my post would have been better had I talked to him about it first, but that is not the only point of agreement. We both agree that extending the debt ceiling is very bad for the Country. We agree that a principle tenant of the Tea Party politics that the debt ceiling should not be increased. Both of us agree that Tom Graves should not have voted for any increase in the debt ceiling. We both agree that the Federal Reserve is flawed and should be re-examined or disbanded. We agree that the federal government could balance the budget if they had the will to do so. We agree that the military is an essential government service that deserves funding. We agree that the EPA and the Departments of Education and Energy could be disbanded without noticing that they were gone. We agree the debt is slavery and with more debt is less freedom. We agree that every email from the Tea Party asks for a donation and there is nothing wrong with asking for voluntary donations. We both agree that in the past our government, whether run by Republicans or Democrats, has been leading us down the road toward socialism (and thus serfdom). We agree that it seems odd that Tom Graves apparently voted for increasing the debt ceiling without explanation. We both agree that the shenanigans at the National Republican Convention were bad for the Republican Party as a whole. We both agree that the vote at the RNC should have failed, but the chairman deemed it passed. We both agree that it is unlikely that Doug Collins will withstand the pressure to increase spending if he makes it to Washington. And we both agree that each citizen has the right and obligation to let elected officials know what they think. I have to admit a flaw in my post: I never equated the continuing resolution with the corresponding PERMANENT increase in the debt ceiling. However, the emails from the Tea Party Patriots never mentioned that HR 117 would permanently increase the debt ceiling either. Of course the debt ceiling would have to rise if the vote was for deficit spending, but I did not connect those dots. As usual Mike did a good job of pointing out a pertinent danger. But that was not the point of my post. I was not really analyzing the correctness of the vote. I was alerted to the vote by the Tea Party patriots and asked to contact my Congressman to vote no. Later I got another email that the bill passed without any mention about who voted for it (or even a link to the vote roster) but asking me to contact my Senators to vote against the resolution when it reached the Senate. In my post, my lack of surety was about the specific vote. Sometimes when faced with two bad decisions, an official will take the “least bad” position. I was holding out that Tom would be able to convince us that this was one of those situations. Since I received nothing critical of Tom individually, maybe reasonable people could disagree about the vote? That is what I was unsure about. (And I’m still open to a persuasive argument from Tom in response to Mike’s comments.) It looks bad, but maybe there is something important about the vote I am missing. Tom Graves was absolutely the Tea Party candidate. See http://www.11alive.com/news/local/story.aspx?storyid=145021 or Google “Tom Graves Tea Party” and see link after link. The Tea Party might not have officially endorsed him, but he was their candidate. I guess today I can say “I told you so” to Tom’s supporters, because I believe that had Lee Hawkins won, he would have voted no (unless there is some unknown lesser of two evils issue lurking). And Tom has followed the Tea Party “line” until his vote last week. Too late to disavow him now. I know exactly how this feels. The GOP gets roundly criticized for supporting candidates that let us down later and sometimes make us look stupid. I was just pointing out that nobody from the Tea Party was crying out about how wrong Tom Graves’ vote was. It seemed pretty wrong on its face. But all I heard was silence when I would have expected outrage. I felt like the silence was favoritism–just like the favoritism in my post about The Times today. Favoritism is just a friendlier form of corruption. Favoritism is what the GOP is always accused of with misbehaving incumbent officials, and it is one of the evils that this blog seeks to expose. I always get in trouble when I get off the intended point and summarize or satirize others in passing. My primary complaint was the silence of the Tea Party and its members regarding Tom Graves’ transgression since he was absolutely their “boy.” He committed a cardinal sin and yet I heard nothing. I was just making sure that I hadn’t missed something. Mikes thorough and persuasive response lets me know that according to the Tea Party, the vote was wrong and Tom Graves just screwed the Tea Party and the rest of us with his vote. Oh, an apparently Mike is a little upset about it. But Mike, I think “ignorant” is a little strong. While I admit to a lack of knowledge about the underlying vote, what exactly has the Tea Party at any level done about Tom and the other yes voters? Besides your comment on my blog, I have to presume that the Tea Party has done nothing yet or you would have mentioned it. Nobody that I know of but me has publicly mentioned that Tom Graves (by name) voted for the resolution. Nobody but me (via my post) has asked for an explanation. Did I miss some email or post? Has the Tea Party confronted Tom about the vote? The power of the Tea Party is their ability to bring a large number of people to pressure politicians on a moment’s notice. This power is unique and is one that is envied by both of the “mainstream” parties. So am I really wrong, or just too quick on the trigger? Are the faxes, emails and letters on their way to him now? What was going to happen publicly or privately? What was planned? Was Tom going to skate? Am I really ignorant of the facts, or did my criticism hit a point? We also seem to agree that people should be consistent, or have a darn good reason for changing their position. Even if we sometimes disagree, I always appreciate the Tea Party bringing important issues and inconsistent positions to our attention—even mine. I hope the Tea Party remembers this vote during Tom’s next Republican primary. And I hope the Tea Party and GOP members remember where they first heard that Tom Graves voted for the continuing resolution. First, ignorant was not as much a slam as a description. For example, it my short involvement with the Republican Party and Robert’s Rules of Order, I have found that I am extremely ignorant. Ignorance applies to all of us in some aspect. Ignorance of how the tea party works is fairly rampant. Second, many of those in the tea party have and will let Tom Graves know our opinions concerning his vote. All in all my fear is his vote symbolizes the problems in the Republican Party and their efforts to put an end to grassroots involvement. I have been receiving copies of email and one phone call from people who were made aware of Congressman Tom Graves’ vote, were unhappy, and let him know about it. Most of those came from Tea Party folks. I hope some rank & file GOP members will join the fray as well. No doubt this issue will come up at the Lanier Tea Party meeting tomorrow as well.